The 15th Century Mitten Gauntlets are modeled on hand armour used during the second quarter of the 1400s and beyond. The steel gauntlets were often used by infantry who wanted to protect their hands when wielding pikes and halberds. Mercenaries and foot soldiers of the era favored these medieval gauntlets, as did knights. 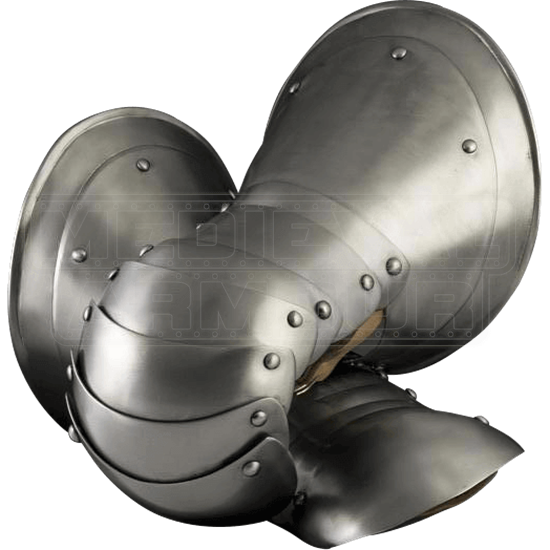 The solid steel plates that cover the fingers offer greater protection than glove-style gauntlets, making these 15th century gauntlets a great choice for live action role-playing and historical re-enactments. These gauntlets do not come with leather glove inserts. One size. Fits up to Size 10.